Just to mix it up a little, I thought that today I would write about something I liked and would recommend to others. 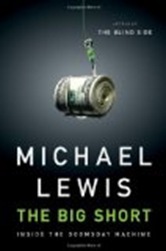 Over the weekend I read Michael Lewis’ latest tome, The Big Short: Inside the Doomsday Machine . It’s not bad. Good even. The book tells the intertwined stories of a handful of investors who saw the subprime disaster coming and bet big accordingly. It is not a broad explanation of broader events. That sort of thing is not what Lewis does, and indeed the book’s prologue and epilogue, in which he tries gamely to put his yarn in a larger context, are the weakest portions of the book and might be skipped by the reader in a hurry. But what Lewis does well, and in this case masterfully, is tell an interesting and entertaining microcosmic story that has wider implications and lessons. If the as yet unwritten full history of the Great Recession could be thought of as a large mural, The Big Short would be an exquisitely rendered corner of that larger, unfinished, painting. It does not actually cover much surface area, but it helps a viewer imagine what the whole work might someday look like. Lewis’ heroes are a few misfits and eccentrics at the periphery of Wall Street who suffered all the scorn and derision you would expect people going against conventional wisdom to suffer before being vindicated by events and rewarded with great heaping wheelbarrows of money. Of course, the reader knows from the start how the story is going to end, but it is a gripping tale of David vs. Goliath nonetheless. Yet, as entertaining as the accounts of the oddball characters Lewis profiles are, and they are indeed entertaining, the book oversells the lunatic fringe element. It is true that the mistaken beliefs that fed the housing and mortgage bubble were very nearly universal. To cause a bubble that size they needed to be. And it took a special kind of cynic to see through it all and put up real money to bet that it would all end very badly. But the subjects of the book are not merely those that saw it coming and got rich, they are those that saw it coming, got rich, and were willing to talk to a journalist about it. That subset is indeed a peculiar, if not anti-social, bunch. And a colorful one. There’s Dr. Michael Burry MD, a misanthropic hedge fund manager with one eye and Asperger’s Syndrome. And Cornhill Capital, essentially a few disorganized and darkly paranoid guys with thin backgrounds in investing who started with $110,000 of their own money in a Schwab account in 2003. Five years later they were worth $135 million. Along the way, the reader learns about the seemed-like-a-good-idea-at-the-time mechanics of mortgage bonds, CDOs, and CDSs. And we get valuable clarity and detail about just what AIG did and why. It has been increasingly clear to those of us follow these things that AIG was not merely the single biggest victim of the financial crisis but also the single biggest cause, the unintentional suicide bomber of Wall Street. The Big Short filled in some blanks in my head about how that bomb was made and how it came to be strapped on by the world’s biggest insurance company. Not to give away any of the plot, but the gist of it is not that AIG and the others who participated in building the bubble were evil or particularly greedy for fat bonuses they didn’t deserve. (Indeed, the book makes the case that some of the most culpable actors, the analysts at the ratings agencies, were the least well paid of all.) The bottom line is that this particular fiasco was not caused by malfeasance but by good old American incompetence. In my experience this is usually the case with financial disasters. The first reaction of the public and media is that criminality must be the root cause of whatever has gone badly wrong. These things don’t just happen. The system works too well for that. There must be somebody who lied and cheated that caused this. In fact, the system has never worked that well, and for every evil-doer out there there are at least ten people who just don’t know how to do their jobs properly. Michael Lewis is not one of those people, and his job is to tell the circumscribed story of what a few particular men and women did over a few years with regard to to a particular issue. His brilliance rests on generally resisting the temptation to draw larger conclusions from the events he describes, allowing his readers to think for themselves. There is just enough background information to allow you to follow the action and just enough personal information to allow you to appreciate the colorful characters. After that, you are on your own. I do have a few quibbles with the book. It lacks an index, something particularly unforgivable in something destined to become source material for the research of others. And I caught enough factual errors on subjects I already knew about to introduce a seed of doubt about the discussion of topics less familiar to me. Most of these errors were trivial, e.g. roulette balls are white and plastic not silvery and metal. But there are some significant ones. Lewis badly muffs the explanation of what 0.3 correlation between the returns of mortgage bonds means. That is not merely finance geek trivia, it is at the core of the mistake that AIG and others made about the risk of pools of those bonds. But Lewis gets the general story straight, and that is what counts. This is, after all, not an attempt at a comprehensive textbook on what happened. That has yet to come, and Michael Lewis will not be writing it. The Big Short is a smaller, very readable and altogether worthwhile book. Hmm. I liked Moneyball, so I might give this a read. Interestingly, in his 60 minutes interview, Lewis had no problem drawing larger picture conclusions that were on shaky ground. Likely, though, that is just what they highlighted in their piece. Your quibble about details is striking to me, because I have noticed this in Moneyball and Blind Side as well. When he is talking about things I know a lot about, he gets enough details wrong, and overstates his case enough that I am suspicious about other things, like this, where I know less. Hey, great site, just stumbled on to it. Second your thoughts on this book but definitely enjoyed hearing about some of the lesser known managers (Burry in particular)… fascinating stuff. Also saw that you’re a hedgie and wanted to make sure you know of my blog: MarketFolly.com. We track prominent hedge funds via SEC filings, investor letters, etc etc. At any rate, pleased to make the acquaintance and look forward to reading your work more. PS – why a PF blog versus a market blog? was just curious. You definitely bring a different viewpoint to the PF mix online though so kudos for that. be so without people behind the success in the fashion industry; either it’s in New York, Toronto, Paris, Milan or London. Michael Kors adorned his models with interesting accessories.